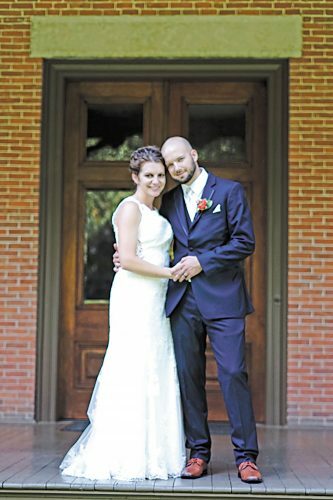 Carolyn Moore and Jacob Scherger exchanged wedding vows at 3 p.m. Oct. 11, 2014, at St. Columba Church, Hopewell Junction, New York. The Rev. 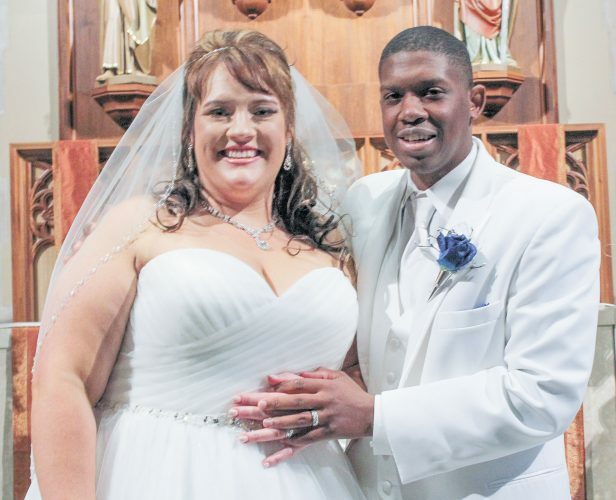 Chris Argano officiated the double-ring Catholic nuptials Mass. A reception followed at Christos, Poughkeepsie, New York. Carolyn is the daughter of Patrick and Linda Moore of Hopewell Junction, New York. Jacob is the son of Dan and Pam Scherger of Tiffin. Carolyn, given in marriage by her father, wore a Mori Lee white, alencon lace gown extending to a chapel train. It featured capped sleeves, a romantic sweetheart neckline and an intricately pleated bodice. 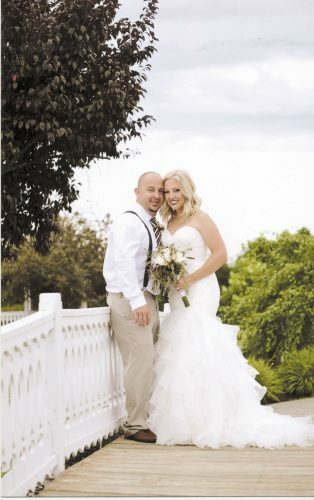 She also wore an Allure belt adorned with crystals and pearls and a fingertip-length veil with lace trim. She carried a hand-tied bouquet of orange and cream roses, midnight calla lilies, burgundy dahlia and green hydrangea. 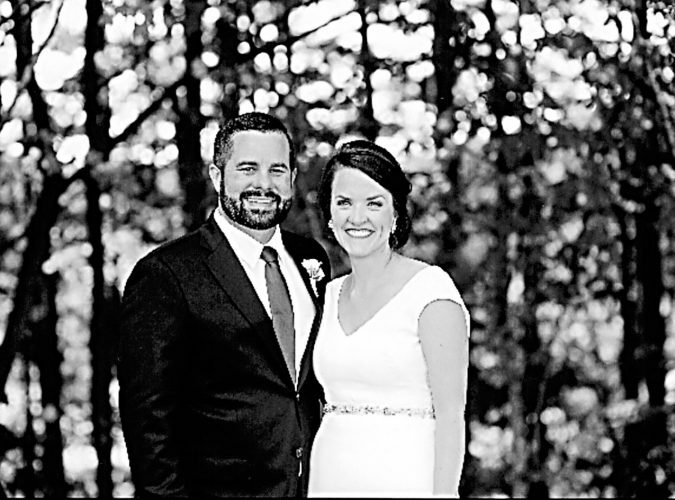 Lauren Sine of Beacon, New York, served as her sister’s matron of honor and Marisa Martino of Boston, Massachusetts, served as her friend’s maid of honor. Bridesmaids were Elizabeth Lewis of Cleveland and Taylor Greene of Columbus, friends of the bride. They wore satin, knee-length, plum gowns with sweetheart necklines and three-quarter sleeve bolero jackets. They carried smaller versions of the bride’s bouquet. 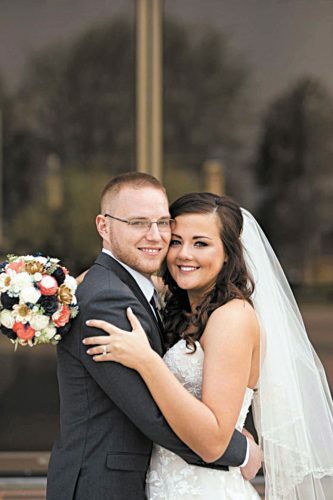 Joe Scherger of Reynoldsburg served as his brother’s best man. Groomsmen included Stephen Hopkins of Bloomington, Indiana, and Taylor Dunn of Findlay, friends of the groom; and Kyle Moore of North Canton, brother of the bride. Esther Moore of North Canton, niece of the bride, and Loren Schalk of Tiffin, cousin of the groom, were flower girls. Oliver Moore of North Canton, nephew of the bride, and Ben Schalk of Tiffin, cousin of the groom, were ring bearers. Carolyn graduated in 2008 from Our Lady of Lourdes High School and in 2012 from John Carroll University. She is a graduate assistant at the University of Akron and is pursuing a doctorate in polymer science. Jacob graduated in 2007 from Calvert High School and in 2011 from Miami University. He is a research assistant at the University of Akron and is pursuing a degree in polymer science. Miscellaneous showers hosted by the bride’s mother July 19, 2014, and the groom’s aunts, Cyndi Schalk, Dana Scherger and Karen Pardi, Aug. 3, 2014. A couples barbecue was hosted Aug. 2, 2014, by the groom’s aunts, Dianne Canode, Terri Schultz and Mindy Haas. A rehearsal dinner was held at Tomas Tapas Restaurant, Wappingers Falls, New York. The couple lives in Cuyahoga Falls.